Our children go through so many different milestones beginning even before they are born. We anticipate their first movements from within the womb, their first smiles, their first words, and their first steps. As they get older, they have their first days of school, their first dates, their first heartbreaks, their first time behind the wheel. The list could go on forever. One of my favorite milestones to watch is when they learn to read. I have been reminded of this one over the past few months with my youngest. Emily is 5 and quickly approaching the end of kindergarten (how did that happen???). Her reading skills have really taken off. As I sat on her bed with her one night, she struggled with a word, but was determined to figure it out. She sounded out each letter, then put them together and said the word. Her eyes lit up and a smile spread across her face. "I did it Mommy! I read it!!" She takes such joy in her new found reading ability and it is a wonderful thing to witness - just as it was when my older two girls went through it. There is one sad thing about it, though. This is the last time it will happen in this house. Emily is the last one who will experience all the "firsts." When it comes to reading, that means there is a whole bookshelf full of well-worn books that will very soon be too easy for the all readers in this house. Board books, Clifford books, Little Critter books, Biscuit books will soon begin to gather dust or be relegated to a box in the attic as all the girls move on to more difficult, more exciting stories. As a former preschool teacher and a lover of words, these books have a special place in my heart and I hope, someday, they will grace the bookshelves of my home again as I read them to grandchildren!! 1. 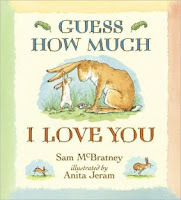 Guess How Much I Love You by Sam McBratney -All time favorite. Ever. 2. 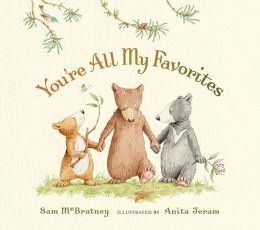 You're All My Favorites by Sam McBratney- This one is special for our family because we have 3 kids. In the story, three little bears ask their parents which child is their favorite! 3. 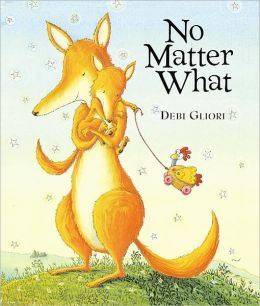 No Matter What by Debi Gliori - A parent fox - could be mom or dad and is referred to as "Big"- explains that he will love "Little" No Matter What. 4. 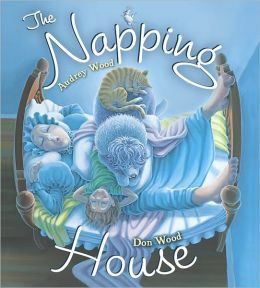 The Napping House by Audrey Wood - the illustrations, done by her husband Don Wood, are absolutely incredible. 5. 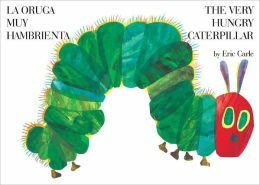 The Very hungry Caterpillar by Eric Carle - a classic! 7. Good Night Moon by Margaret Wise Brown - another classic! 8. Harold and the Purple Crayon by Crockett Johnson - This book was first published in 1955. I love the simplicity of the story - just a boy, his crayon, and his imagination. 9. God Gave Us You by Lisa Bergen - In this sweet book, a little polar bear asks his mommy bear where he came from and her answer is "God Gave us You." There are others in the series, too, like God Gave Us the World, Gad Gave Us Love, etc. 10. 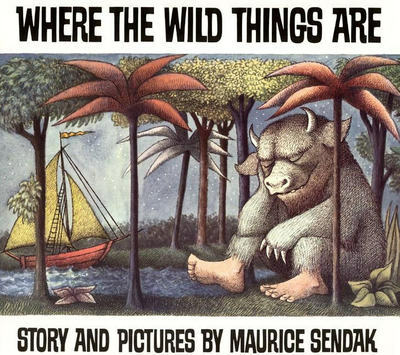 Where The Wilds Things Are by Maurice Sendak - This one is a classic that always leaves me wondering if Max is dreaming or using his imagination. O.K. I know it is a Tuesday TEN post, but I can't stop at ten!! Here are a few more! 11. Chicka Chicka Boom Boom by Bill Martin Jr. - When I taught preschool, we had this book on tape with Ray Charles narrating. (yes, I said tape and yes, it has been that long ago!). I still read it with the same inflections and rhythm he did! 13. Brown Bear, Brown Bear - by Bill Martin Jr. - Another classic. I think a lot of children learn colors through this book. I have also seen many who can "read" it because they can just look at the pictures as they go. 14. Ten Apples Up On Top - by Dr. Seuss - This is a cute book; not the typical Dr. Seuss. It happens to my my youngest one's current favorite! 16. Have You Filled A Bucket Today? 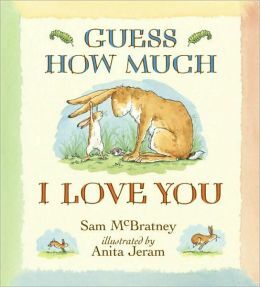 - by Carol McCloud - This book is a great way to help children understand the importance of being kind and showing love to others. Well, I could probably list 100, but I'll stop here. What are some of your favorite children's books?? Next Week's Tuesday Ten topic: If I had a million dollars . . . .
Great list of books, We love the David books, Where the Wild Things Are, and Good Night Moon. Will have to check out God Gave us You. Love If You Give a Mouse a Cookie!!! My little one really likes the newest one - If You Give A Dog A Donut, too! I am a great lover of children's books and we have LOTS of books. It is my weakness and we pick up a pile or two every time we go to the local thrift store. I was surprised, therefore, to see more than one book on your list that I have not even heard of!! Shame on me. I am going to write those down and check them our from our library. Great list - I love to see what others enjoy reading to their children. If I was more organized (oh, how I used to be...)I would learn how to grab that button of yours and make up my own list. :) Thanks!! It was really hard to narrow it down - obviously I couldn't stop at ten. I even read one with my youngest tonight and though "Oh, i should have put that one on there!!" Ha!! Sometimes I break out into a Seuss-like rhyme myself. "To bed, To bed I said. Rest your head, it's time for bed!" My girls and I love so many of these books. There were a couple that we haven't hear of before, but will be getting them once we go to the library this weekend!! Thank you for Sharing!! Thanks for visiting!!! Glad you enjoyed the list!